Resource Development in Ontario’s Colleges – What’s the Future? This paper provides a brief historical account, and differences in philanthropy between Ontario’s colleges and universities. Several theoretical concepts will be explored to explain donor motivation in Ontario’s higher education sector. The final section of this paper explores non-traditional resource development strategies that Ontario colleges can consider to increase support. Keywords: Ontario, college, fund raising, fundraising, resource development, finance in higher education, university fundraising. The not-for-profit (NFP) and charitable sector in Canada represents an average of 8.1 percent Gross Domestic Product (GDP), employs over 2,000,000 people and boasts over 170,000 NFP organizations, of which 85,000 are registered charities (Imagine Canada, 2012-2013). While from a donor perspective, Canadians gave approximately $10.6 billion in 2010 (Turcotte, 2012). In Ontario, there are over 46,000 NFPs, contributing over $50 billion to the GDP and engages over 5 million volunteers annually (The Partnership Project: Strengthening Ontario’s Not-For-Profit Sector, 2011). From a post-secondary education perspective, Canadians donated $117 million to “Universities and Colleges” and $309 million to “Education and Research” in 2010, totaling $426 million dollars. This represents 4 percent of the $10.6 billion donated (Turcotte, 2012). These two categories were combined in order to account for higher education institutions that teach, research and provide other educational services such as continuing education and vocational training. 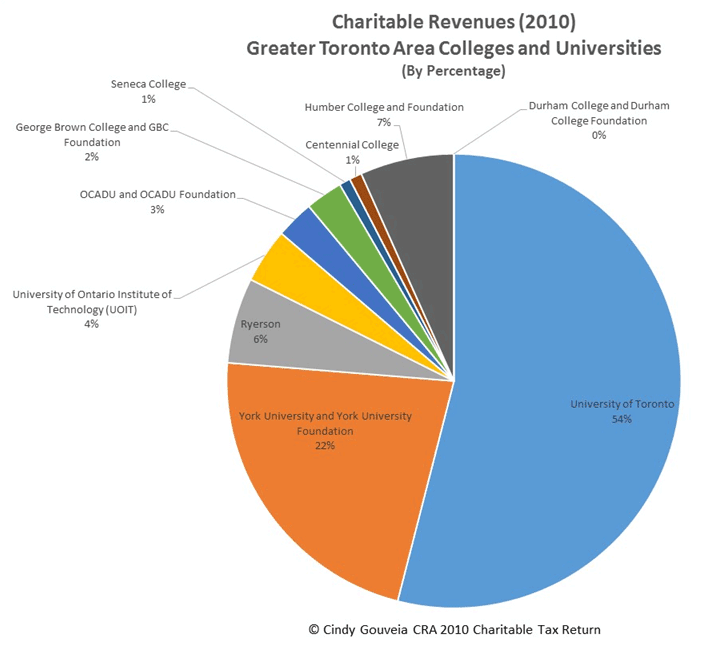 While the distribution of these funds between all individual institutions is not readily available, the author’s analysis of tax return information between universities and colleges in the Greater Toronto Area (GTA) reveals the universities dwarf the colleges in acquiring these private dollars. The author has compiled a chart, based on 2010 CRA returns for universities and colleges in the GTA which further illustrates the disparity between these institutions. The following chart compares university and college fundraising results (Appendix A). 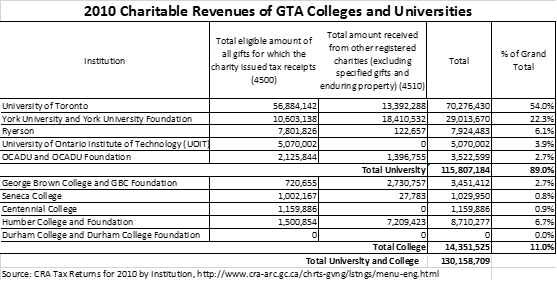 The total charitable revenue was approximately $130 million for the GTA colleges and universities in the 2010 period. The University of Toronto alone, reported receipted donations of over $70 million (Canada Revenue Agency, 2010) which is almost five times more than the combined fundraising activity of all GTA colleges. This statistic suggests that universities have a monumental “leg up” on colleges in fundraising. The question is why? The first section of this paper attempts to answer this question through a historical analysis of philanthropy in Canadian universities and colleges. The second section of this paper explores theoretical concepts which could explain the difference in donor behaviour between universities and colleges. The third section of this paper reviews several non-traditional resource development strategies, including Strategic Philanthropy (Porter & Kramer, 2002), that colleges can employ to advance their “fund” raising agenda. Finally, the conclusion of this paper summarizes the findings and explores different fundraising activities that colleges could consider to increase private support. The earliest Canadian post-secondary educational institution was created by the Jesuit religious order in Québec City (1635) offering studies in Lettres and Philosophie. In 1663, Bishop Laval started Le Grand Seminaire du Québec later becoming the University of Montréal in 1919 (University de Montréal, 2015). Along the same vein, English speaking universities were founded by several different religious orders including the Presbyterians, Methodists, Anglicans and Baptists (Kelly, 2009, p. 4). An early example was King’s College founded in 1787 by the Anglicans in Fredericton, New Brunswick, followed by King’s Colleges in Windsor, Nova Scotia and Toronto in 1827. These institutions were largely funded by church donations, private philanthropy, tuition and government grants (Kelly, 2009). Even after Confederation in 1867, denominational post-secondary institutions were still required to rely on philanthropic donations as a means of survival. For example, in 1883 George Munro Grant, Principal of Queens College in Kingston, petitioned to the Government of Ontario that these universities should receive the same funding as their public counterparts. Munro argued that the University of Toronto had an unfair advantage over the denominational schools as it was privy to public tax funds. Unfortunately, Munro’s effort failed to achieve any meaningful results. Thus, Canadian denominational universities had no choice but to rely on their alumni and other interested supporters to survive. This philanthropic activity continued into the 1960’s, when these universities finally succumbed to financial pressures and set aside their religious affiliations in order to receive the same government funding as their secular counterparts (Kelly, 2009). However, despite the financial hardship, one may argue that the requirement for these universities to raise funds over the prior 100 years, coupled with their religious giving activities and the reputational character that they have developed, has enabled them to develop an internal culture of philanthropy to create solid networks for private support. As a matter of fact, the first Canadian Alumni Funds were introduced in 1949 to instill a culture of giving at Queens University (albeit, shortly after Princeton in the US introduced their Annual Fund). With a nearly 200-year history of fundraising under their belts, it would appear that Ontario’s universities have had more experience in developing and securing private and alumni support at a higher rate, than their more nascent college counterparts. Ontario was the third province in Canada that introduced the college system, behind Alberta and British Columbia. Colleges were traditionally seen as terminal education, with an emphasis on vocational skills, where students could enter the workforce immediately after graduation – there were no pathways developed to transition students into universities. When Ontario’s colleges were originally established, there was no intention for the province to carry the entire cost of education according to Bill 153 (1966), Section (6); however, most of the college’s operating expenditures were covered by the province and to a lesser degree, tuition. College funding decreased in the 1970s (Clark, Moran, Skolnik, & Trick, 2009) and by the late 1980s per student funding fell by about one-third (Clark, Moran, Skolnik, & Trick, 2009. p. 81). On November 30, 1995, the Minister of Education and Training at that time, John C. Snobelen, issued a policy directive to all colleges. This statement emphasized concern for the fiscal deficit at that time, and handed down mid-semester budget cuts. These budget cuts totaled $120 million for the college system, and $280 million for the universities totaling 15% of overall funding. The policy directive also promised to commission a discussion paper to inform the “key directions and policies the province might pursue with respect to post-secondary education”. In December 1996, a final report was presented to the Minister with recommendations on the future priorities for the post-secondary education sector in Ontario (Smith, Cameron, Gorbet, Henderson, & Stephenson, 1996). This report provided many recommendations including cost sharing, role linkages and meeting future needs. In one paragraph, the report states, “The recent decision by the Ministry of Education and Training to rescind policies that limited college fundraising efforts reinforces our sense that these institutions have moved to a new stage in their interaction with the private sector” (p. 44). Although the author could not find the specific policies that limited colleges from fund raising, it is important to note that there appeared to be fundraising restrictions on colleges up until this report. This was the catalyst that opened the gates for colleges to fundraise and seek alternate forms of private support. Although these institutions had the opportunity to increase student tuition at that time, administrators and staff did not believe it was the right decision. Instead, the colleges decided to establish ancillary charges, increase foreign student enrolment, defer capital improvements and take the first tentative steps in securing private support. However, only now are colleges seriously considering fundraising as a strategic tool to acquire private monies for scholarships, capital, and/or programming. Interestingly, college’s funding formulas do not account for these private donations, which means donors are assured their contributions are not going to replacement costs (Lang, 2005), unless directed by them. Thus, with no real historic philanthropic context and underlying support structure, colleges have raised modest private support, compared to universities. To further complicate the fundraising landscape, colleges have been impacted by the ambivalence of the citizenry towards their need of private funds. As colleges traditionally were being funded largely by the state, there may be a perception with tax payers that since they are already paying for it, there should be no need for private funding. Ontario’s colleges must break through this apathy and create awareness within the public, business and even their own alumni that giving is essential, so that colleges can fulfil their accessibility, inclusion and community development tenets – the pillars upon which the system is based. Recent European research points to the fact that voluntary contribution may actually be impacted by the educational institution’s geographical region, and the implementation of the welfare state (Breeze & Gouwenberg, 2011, p. 13). Canada enjoys a liberal welfare state, where many of the social programs are administered and / or funded by the government. This could explain the level of apathy toward charitable giving to colleges. Another layer of complexity is the competitive landscape for the philanthropic dollar, particularly in Ontario. SickKids Hospital, United Way and the Canadian Cancer Society are just a few large scale charities that all share a meaningful cause, established a need-based top-of-mind awareness and already have an existing base of loyal donors. While this paper will not address these competitive pressures, it is important to frame the prevailing social, economic and competitive context in which colleges compete for the private dollar. Now that we have addressed the historical, political and extraneous social factors that have impacted the efficacy of college versus university fundraising; we are now ready to explore how several key theoretical concepts can explain the reasons behind these results. Theory of charitable giving (Bruggink & Siddiqui, 1995). The literature reviewed in this paper states that there are three motivating factors encouraging people to donate: altruism, reciprocity and direct benefits. University alumni are motivated to donate to their alma mater based on altruism – the need to give for a broader social good. The time and experiences they had during their academic years acts as a catalyst for them to “give back” to their school. Reciprocity is the idea that the alumni donor feels a certain obligation to give back to their alma mater based on what they “received” from their school (i.e. a stellar education, their first co-op experience leading to a job, contacts and networks that they would not have otherwise been privy to). Direct benefits, although not necessarily charitable in nature, refers to the type of personal benefit the alumnus would receive in return for their contribution (i.e. naming opportunity, perpetuating a strong brand reputation of their university, etc.). Many universities have residences for students which present a different level of engagement with the institution as well as other students and faculty. The result of this increased engagement may also further explain the motivation to give from alumni. In contrast, colleges were created as commuter schools, whose students may typically have obligations outside of school (family, part time jobs, etc.). The absence of this residential engagement experience in colleges could potentially be one explanation to the lack of motivation by their alumni to contribute back to their school. Organizational identification (Mael & Ashforth, 1992). Organizational identification theory is defined as, “a perceived oneness with an organization and the experience of the organization’s successes and failures as one’s own” (Mael & Ashforth, 1992, p. 103). There is a direct correlation between alumni giving behavior, organizational prestige and satisfaction with the institution (Skari, 2014). The findings suggest that the more engaged the students are during their academic tenure, the more likely they are to donate. This relates back to the university residential school culture where these institutions have the ability and opportunity to engage with the students at a level that is deeper than colleges, hence, the likelihood of university alumni giving could be greater than that of colleges. Associative goods (Hansmann, 1999). Hansmann describes Associative Goods as, “when choosing which producer to patronize, a consumer is not just interested in the quality and price of the firm’s products, but also in the personal characteristics in the firms other customers” (Hansmann, 1999, p. 12). Hansmann relates this concept specifically to higher education and the recruitment of students, faculty and resources. These institutions are stratified in the U.S. higher education market based on, among other things, their reputational character. This is a cyclical paradigm; where the better the students, the easier it would be to attract the top faculty – and the better the faculty and graduates, the easier it would be to recruit the best students and acquire private support for items such as, research and innovation. This dedicated research and knowledge creation function in universities not only attracts government dollars, but to a large extent, crucial private dollars. The same can be said for universities in Ontario, who can exploit similar programs. For example, the Canada Foundation for Innovation (CFI) founded in 1997 by the Federal Government matches up to 40 percent of research infrastructure for innovation developments benefiting Canadians and the global community (Canada Foundation for Innovation, 2013). Universities are more frequently successful than colleges, in acquiring CFI funds in concert with business to fund initiatives that meet the program requirements. Ontario universities have acquired over $1.3 billion dollars funding 3101 projects, compared to colleges at almost $14 million dollars, and only 24 projects (Canada Foundation for Innovation, 2014). It is also noteworthy that colleges were not eligible to apply for these funds until 2002, when the legislation changed to allow colleges to do applied research. 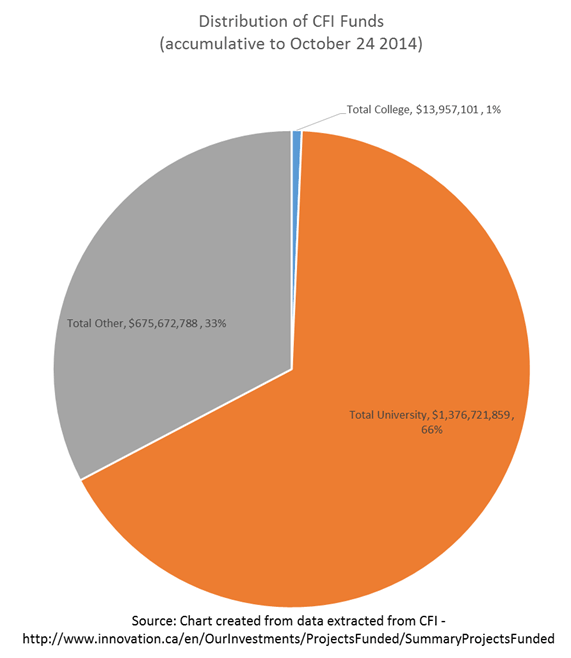 Universities acquired 66 percent of the overall funding, other organizations at 32 percent and Colleges at only a paltry 1 percent (Appendix B). The continued expansion of knowledge and knowledge transfer perpetuates the universities prestige and reaffirms their level in the educational hierarchy as espoused by Hansmann. Socio-Economic Status (SES). According to Newman (1854), university courses and programs were historically designed to expand “liberal” knowledge, as opposed to “usable” knowledge. He describes liberal knowledge as the exploration of knowledge itself, whereas “usable” knowledge is acquired for employment purposes. In his terms, those who have had to obtain usable (vocational) knowledge could be seen as the “working class” and attend college. In contrast, those who had the time and financial resources to attend university were often better off—these university students tend to come from higher SES and stratify at elite institutions (Davis, Maldonado, & Zafira, 2014). While students from lower SES backgrounds were more likely to be excluded from university education altogether (Frempong, Ma, & Mensah, 2012). As a result, college alumni may be at an economic disadvantage upon graduation and their earning power will normally continue to underperform that of their university counterparts (Statistics Canada, 2006). College alumni usually gain employment in trades or service fields which typically pay less than that of professional occupations which university graduates are more likely to hold. Therefore, university alumni are in a better financial position to donate compared to college graduates. Clearly, the theories and examples cited above, illustrate how universities have a distinct structural fundraising advantage over their college counterparts. These inequities may take generations to overcome given they are rooted in our core societal and economic framework. Instead, colleges may consider the adoption of a different, multi-pronged strategy which can help mitigate these inequities and raise more funds in the future. While this section will not focus on all these trends, the literature and media points to the increased attention toward the increased scrutiny of NFPs, particularly fundraising costs, executive compensation and measureable results (Giusto, 2010; Stern, 2013; Hay & Muller, 2014). This increased scrutiny is forcing the charitable sector toward a clearer and heightened level of demonstrable accountability and measurements. Donors not only want to get involved in what the charities are doing, but they also want clear measurements as to how their dollars are impacting the cause. Charitable organizations need to move away from selling their cause, to justifying them. As a result, this presents a unique positioning opportunity for colleges to fulfil these donor expectations and expand development departments to include non-traditional funding opportunities. The next section of this paper explores different types of resource development strategies. While these strategies may not be altruistic in nature, the end result is that the college can develop private resources for the benefit of the greater good, which fits within the spirit of philanthropy. Strategic philanthropy. “Strategic philanthropy” has been described as leveraging organizational resources to gain competitive advantage and create positive social change (Porter & Kramer, 2002). Organizational resources can be in the form of gift-in-kind, employee volunteer time, sharing of facilities, and monetary donations, etc. (Saiia et al, 2003). Some organizations have gifted patents and technology, however, accepting gifts of this kind is highly cautioned as there are expenses associated with these types of donations (Desruisseaux, 2000). Although Strategic Philanthropy is becoming a common platform for many organizations, it appears that companies are not truly strategic about their donations (Porter & Kramer, 2002), and still largely unintentional about this concept (Slack & Campbell, 2008; Foster et al., 2005). While Strategic Philanthropy is not altruistic in its purest form (Sage Publications, 2012; Rowley, 2012), the spirit of the corporate contribution fits within the general definition of “private resources for public good.” The one caveat is that organizations also get closer to their mission while creating positive social change. Colleges could tap into the strategic philanthropy programs of organizations to gain a larger share of the donor dollar through levering the existing assets of the institution. Colleges serve as fertile breeding grounds for industry intelligence, new markets and staffing / recruitment opportunities. Depending on the location of the college (as each are situated in communities with different demographics), organizations could tap into the student body to conduct market research and intelligence on their services and products in exchange for financial support. College attenders are also target groups for staffing and recruitment. The unique demographic of college students also serve as a new or existing market for organizations. Colleges could present organizations opportunities to support their mission, and create positive social change within communities. For example, in 2010, the Southern Alberta Institute of Technology (SAIT) received their largest donation to date by John and Cheryl Aldred (SAIT Polytechnic, 2010). The donation went to fund The Aldred Centre which houses the School of Technology and Trades as well as a research facility dedicated to advancing technology. John Aldred started as a mechanic and later founded a company that supplied equipment to the oil and gas sectors. In an interview with the Globe and Mail, he stated, “One of the things that really always riled me was the fact that the social stature of trades as a career was really very low and it tended to keep young people away from those vocations,” (Waldie, 2010). Consequently, in addition to Aldred’s philanthropic motivations, the strategy of funding this building perpetuates the talent and resources required to sustain an industry where the physical and market demands are increasing. The students and graduates will serve as a pipeline for the oil and gas industry in Western Ontario, coincidently, where Mr. Aldred made his fortune. Colleges could actively seek partners like Mr. Aldred where a symbiotic relationship / partnership can be established advancing both social values and corporate strategy simultaneously. One could argue that the act of Strategic Philanthropy is not charitable, but the impact of it, would be. Research and entrepreneurial activities. As of 2002, colleges were legally recognized to conduct applied research (Clark, Moran, Skolnik, & Trick, 2009, p. 63). This legislation enables colleges to acquire funding their university counterparts have long been privy. Traditionally, universities conduct academic research, and colleges, on the other hand, conduct applied research – research that is predominantly focused on solving industry problems. For example, the creation of Technology Access Centres are made possible through funding provided by the National Sciences and Engineering Research Council (NSERC). These Access Centres provide college expertise, equipment and technology to small and medium sized businesses to become more productive in the Canadian economy. An example is the Food Innovation and Research Studio, at George Brown College that was created by this grant. The facility is capable of research related to food and nutrition including product testing, product enhancement, nutritional labeling among other research services. Restaurants and other food related organizations have engaged in FIRSt’s (Food Innovation Research Studio) services to test, develop and package their existing products – for a fee. Recent legislation related to nutritional food labelling has also attracted revenues that were not traditionally associated with colleges. Fundraising teams within colleges can leverage existing relationships to bring additional interest in the applied research function at colleges. There are many ancillary benefits, other than revenue, that could be realized through leveraging the research function at colleges. Students could complete their co-op and gain employment at these research facilities and faculty will have opportunities to participate in the generation of new knowledge. Thus, innovative solutions that solve industry problems may have a broader socio-economic impact. This applied research function represents an interesting opportunity to expand this source of private funding, and much needed income. There are a number of existing employer relationships that colleges could leverage to access different sources of non-traditional revenue. Corporations are looking for ways to provide creative professional development and team building opportunities for their staff. Colleges, in the past, have done some corporate for-profit training, however, under the current landscape, it is very difficult to compete with certificate / workshop courses that are delivered by branded elite universities (i.e. Rotman, Shulich). Colleges have an abundance of interesting facilities (classrooms, lecture theatres, etc.) that could be used for corporate retreats and team building activities. Colleges could introduce these “corporate packages” as both stewardship benefits and revenue generating activities. Continuing education students are a group that would likely have the capacity to give, and is an untapped group. A small “usage fee” could be imposed on the registrant to go toward capital improvement for the usage of the space, building and/or equipment. Imposing this type of student “fee” within full-time programs requires the approval from the institution’s student union groups; whereas no such association exists for continuing education students. While not necessarily charitable in nature, the revenue generated from this group could go toward capital improvements, which will sustain these physical learning environments for both the full time and part time user. There are numerous entrepreneurial activities that could introduce new revenue into the college. While some of these concepts are raising funds, they are not necessarily fundraising, in the altruistic, traditional sense. The result however, is the ability to support underfunded areas to sustain the college’s mission of access, equity and quality. New frontiers of philanthropy. Salamon’s most recent publication, Leverage for Good – An Introduction to the New Frontiers of Philanthropy and Social Investment (2014), introduces real market financial tools as a way for NFP and charities to acquire funds for social impact, while investors realize financial gains. Conceptually, this is related to Porter and Kramer’s Strategic Philanthropy but takes it a step further from corporations to free market. The book introduces new Actors and Tools that are available to charitable organizations to leverage financial investments. Secondary Markets are institutions that purchase (debt) loans – refreshing the capital available to perpetuate the originator’s loan system. An example cited is Habitat for Humanity (HFH); a charitable organization that supports building homes in rural areas of Africa. HFH finances the build and underwrites the mortgages of the homeowner and has had great success in mortgage repayments. Free market fund managers then purchase the outstanding mortgages from HFH, and floats these assets within Secondary Markets which are typically bundled with pre-existing funds. The purchase of these mortgages results in an injection of cash to HFH to further finance more homes and mortgages, and at the same time provides modest returns to investors who are keen in seeking not only financial returns on their investments, but also social impact. Another example provided are Enterprise Brokers. In its most simplistic form, these are the individuals who act as middle-people helping to identify the social ventures providing the right amount of social and financial return, to those who have significant capital to invest. Traditional fundraisers connect philanthropists to the causes that they are passionate about – this is an interesting commonality between fundraisers and Enterprise Brokers. Colleges could adopt the Secondary Market actors with a student loan program or an entrepreneurship fund for students who are in financial need and / or have business ideas that require seed money. Partnerships with fund managers could be established to promote social equity / impact of projects, and set expectations around modest private returns. Eventually, fundraising departments could adopt an Enterprise Broker model of staffing and have these types of “fund” raisers as a core part of their development team. While some may argue that the New Frontiers of Philanthropy is not necessarily charity in its most basic from, the general definition employed by Salamon in this book is, “the provision of private resources for social or environmental purposes” (Salamon, 2014, page 16). This definition is also applicable to philanthropy – as the end result is the same. The road in which one travels to get there is uniquely different, but this may be due to the changing trends of philanthropy and the pressing need for colleges to raise money. Universities, compared to colleges, have had a longer history in Ontario. Over the course of time, they have developed a culture of philanthropy through their unique historical context, their role in research and knowledge creation, their tenure in fundraising, and the different socio-economic status of their students and alumni. The theories and conceptual frameworks discussed in this paper further explain donor behaviours – there is a special connection that university alumni enjoy with their alma mater motivating them to give. The university’s reputational character also attracts major donors, and finally their research function entices large scale public and private contributions – which is difficult, under the current context, for the colleges to match. However, colleges are encouraged to see resource development differently than their university counterparts. They do not share the same historical context, alumni affinity and research capabilities that can leverage increased donor support. Colleges can adopt an entrepreneurial culture in attracting resources for their institutions through strategic philanthropy, service experiences and different financial tools. While some of these efforts are non-altruistic in nature, these strategies are aligned with the donor trend of accountability, measurability, personal involvement and social impact. We do not know what the future of “fund” raising holds for colleges – what we do know is that in order for colleges to compete for financial resources, they will likely have to do something different than their university counterparts. If we fast forward 100 years from now, what will the future of resource development look like? In 1967, Davis stated that colleges would be “separate but equal.” Colleges are separate, but are faced with a daunting task in developing their fund raising capabilities before they can be considered “equal,” to their university counterparts. Banducci, B. (Winter 2005, Issue 50). Women’s philanthropic leadership: How is it different? New Directions for Philanthropic Fundraising, p39-53. Bowman, N. (2010). Cultivating future fund raisers of color at historically black colleges and universities. International Journal of Educational Advancement, 10(3), 230-234. Breeze, B., & Gouwenberg, B. (2011). Giving In Evidence - Fundraising From Philanthropy in European Universities. Luxembourg: Publications Office of the European Union. Bromley, B. (1999). Answering the broadbent question: The case for a common law definition of charity. Estates, Trusts and Pensions Journal, 19(1), 21. Bruggink, T., & Siddiqui, K. (1995). An Econometric Model of Alumni Giving: A Case Study For a Liberal Arts College. American Economist, 52-60. Buhai, S. L. (2012, October). Profession: A Definition. Fordham Urban Law Journal, 40(1), 241-281. Clark, I., Moran, G., Skolnik, M., & Trick, D. (2009). Academic Transformation; The Forces Shaping Higher Education in Ontario. Montréal and Kingston: Queen’s Policies Studies Series, McGill-Queen’s University Press. Davis, S., Maldonado, V., & Zafira, D. (2014, February). Effectively Maintaining Inequality in Toronto: Predicting Student Destinations in Ontario Universities. Canadian Review of Sociology, 51(1), 22-53. Davis, W. G. (1967). Basic Documents. Toronto: Ontario Department of Education. Desruisseaux, P. (2000, May 26). Universities Venture into Venture Capitalism. The Chronicle of Higher Education, 46, 38, A44. Foster, M., Meinhard, A., Berger, I., & Wright, P. (2005). From Philanthropic Strategy to Strategic Philanthropy: Selected Canadian Case Studies. Centre for Voluntary Sector Studies, Ryerson University. Hardy, P. (2014). A History of Philanthropy in Canada. In G. Mallabone, & G. Mallabone (Ed. ), Excellence in Fundraising in Canada (Vol. 2, pp. 13-26). Toronto: Civil Sector Press, a Division of Hillborn Group Ltd.
Kelly, S. G. (2009, February). Private Money for the Public Good: Higher Education Philantrhopy in Canada and the United States. Canadian Journal for New Scholars in Education, 1(2). Lang, D. (2005). Formulaic Approaches To The Funding of Colleges and Universities. International Handbook of Educational Policy, 1-21. Logan, D. W. (1953). Report of the Committee on the Law and Practice Relating to Charitable Trusts. The Modern Law Review, 343-358. Mael, F., & Ashforth, B. (1992). Alumni and Their Alma Mater: A Partial Test of the Reformulated Model of Organizational Identification. Journal of Organizational Behaviour, 13, 103-123. Mann, T. (2007). College Fund Raising Using Theoretical Perspectives to Understand Donor Motives. International Journal of Educational Advancement, 7(1), 35-45. Petty, J. G. (2007). Introduction: Union gives strength—diversity and fundraising. International Journal of Educational Advancement, 7(3), 171-175. Porter, M. E., & Kramer, M. R. (2002). The competitive advantage of corporate philanthropy. Harvard Business Review, 80, 56-68. Saiia, D. H., Carroll, A. B., & Buchholtz, A. K. (2003). Philanthropy as strategy when corporate charity “begins at home.” Business and Society, 42(2), 169. Salamon, L. M. (2014). Leverage for Good: An Introduction to the New Frontiers of Phiolanthropy and Social Investment. New York: Oxford University Press. Skari, L. A. (2014). Community College Alumni: Predicting Who Gives. Community College Review, 41(1), 23-42. Slack, R., & & Campbell, D. (2008). Corporate “Philanthropy Strategy” and “Strategic Philanthropy.” Business and Society, 47(2), 187-212. Stern, K. (2013). With Charity For All: Why Charities are Failing and a Better Way to Give. New York: Random House of Canada Limited. Turcotte, M. (2012). Charitable giving by Canadians. Toronto: Statistics Canada. Cindy O.Y. Gouveia is President of the George Brown College Foundation. She earned her MBA at the University of Guelph, and is currently a doctoral student at the Ontario Institute for Studies for Education (OISE) at the University of Toronto. Views expressed by the authors do not necessarily reflect those of College Quarterly, or Seneca College. Copyright SenecaPress © 2016.